Enjoy special savings and perks. We created a Loyalty Program to show you how much we appreciate you. 5% + Back on All Custom Items The more you buy, the more you earn! Shop everything- no products are excluded. More Time to Shop Redeem your BandBucks on any purchase. All BandBucks earned do not expire until 6 months after purchase. Easy to Use BandBucks automatically show as a discount. No codes, no fuss. It’s simple! BandBucks are credits that can be used towards your next eligible purchase.. It's our way of saying thanks for trusting us with your business. How many BandBucks will I earn on my orders? BandBucks members earn 5% BandBucks on all eligible purchases. Your BandBucks will be calculated based on the final products cost spend on your prior order, after deductions for discounts and BandBucks. How are BandBucks earnings calculated? 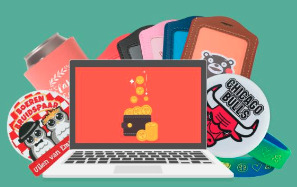 BandBucks are earned on the purchase amount of the goods, excluding shipping, after all applicable discounts are removed, and after Tax is applied. Newly issued BandBucks will be automatically credited to your account upon shipment of your order. BandBucks are only earned on the total product cost. Can I spend my Bandbucks immediately? BandBucks will be earned and available for use once the order you earned them off of has shipped out from our facility. Do I earn BandBucks on every purchase? You earn BandBucks based on the net paid amount on every customized order excluding the shipping, production and tax cost. Bandbucks are not earned on Sample items. If you use previous BandBucks to discount an order, you will only earn new BandBucks on the remaining balance of your order. How do I become a BandBucks member? Joining BandBucks is automatic. You can join for free by clicking here All customers with account are enrolled. New and regular customers will immediately begin earning BandBucks on all purchases starting January 15th, 2019. Have I earned BandBucks for my latest purchase? BandBucks will be earned against all qualifying spend from January 15th, 2019, onward. How do I use my BandBucks? You can use your BandBucks on any custom purchase when you have a BandBucks Balance. Bandbucks may not be redeemed on sample items. First, you must log in with your username and password, and once you have filled your cart and proceeded to check out, your BandBucks will automatically be applied as a credit to your cart. Can I play my whole order using my bandBucks? Yes. If your BandBucks balance is greater than your entire pre-tax total, you will owe nothing on the order. All taxes are calculated off of any balance after BandBucks are applied – if no balance remains, taxes will zero out since they calculate off of this zero balance owed. BandBucks expire 6 months after the purchase that generated them. You can review and redeem individual BandBucks distributions on the bandBucks Page of your account.